as part of the Princeton Public Library Local Author Event on Saturday, March 24 from 1 to 4 pm. The day will also include seminars by various professional writers. And, since I am the best author to write about Seattle music who lives within a 20 miles radius of Philadelphia*, I have been selected to do a five minute reading at 3:10 pm. Should be interesting…I’ll have to select the most abruptly outrageous passage to offer unsuspecting patrons. Suggestions are appreciated. * – actually, they just randomly selected people to read, but you probably already knew that. These things are always fun…especially when they’re at an independent record store like Main Street Music. They have a great selection of new and used vinyl and CDs…all at reasonable prices. Prior to the event, MSM’s Jamie asked if she could order some relevant CDs ahead of time. I suggested a few folks, and then when I got there I noticed they had–in addition to Nirvana, Soundgarden and Mudhoney–Gas Huffer, the Young Fresh Fellows, and, and…the Monkeywrench! For those not familiar with the last band, the Monkeywrench was one of those Seattle super-group side project things featuring the U-Men’s Tom Price and Mark and Steve from Mudhoney. I was proud…and one of my friends bought a copy at my urging. Some friends and patrons watched as I did my Seattle schtick…nothing too outlandish, although this time I remembered to read the excerpt on the Thrown Ups’ “Dirtiest Band in the World” show at the Central. I want to thank MSM’s Pat and Jamie for hosting the event as well as Lucky’s for contributing beers…and thanks to the folks who stopped by. I will have a table (well, half a table, apparently) at the Princeton Public Library Author Day Event on Saturday, March 24, from 1 to 4 pm…and will be signing copies of The Strangest Tribe. The Library will also randomly select a few of us to do readings, so keep your fingers crossed. March 2, 7 pm in Manayunk, PA.
Sonic Youth’s Thurston Moore stopped by Siren Records in Doylestown, PA recently, and was perusing my book…and, according to Siren’s owner Blair, he appreciated its coverage of lesser-known Seattle bands. So yeah, I’m happy. 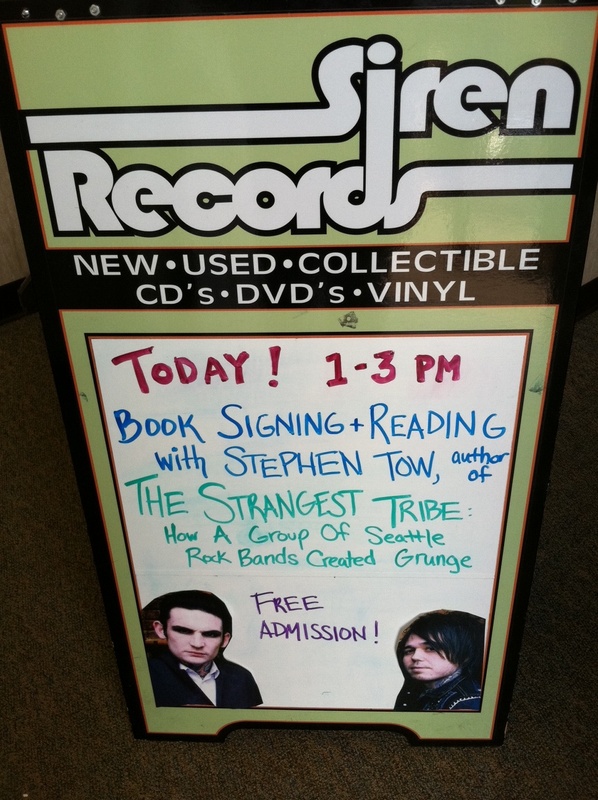 Doylestown, PA’s Siren Records graciously invited me back for a second book reading and signing. This time, I would have the opportunity to play musical and interview clips over the store PA.
My wife and daughter sat down as I set up my array of laminated Seattle photos and show posters. I played a few musical selections to get the audience warmed up: “Polly” and “In Bloom” by Nirvana, “Half Past You” by Love Battery, and (at my daughter’s request) “Don’t Take It Personal Dave,” by the Cops. I saw a few patrons physically jump. I then read the notorious U-Men 1985 Bumbershoot (annual Seattle outdoor music festival) story, where the band set fire to a moat in front of the stage. The band members didn’t realize that the moat actually ran underneath the stage, and that flames would follow. But the U-Men kept performing, oblivious to the danger of the players themselves going up in flames. A clip of U-Men guitarist Tom Price’s assessment of the situation followed…”We just kept playin’,” he said with typical Seattle nonchalance. I talked about the incredible diversity of the Seattle music scene, which existed even during grunge’s heyday–offering up the Young Fresh Fellows’ “Amy Grant,” and Jack Endino’s experimental “Sideways Savannah” as evidence. I’d again like to thank Siren’s Blair and Chloe for hosting the event, and for supporting local writing.